Simply click on your preferred price and see instant results within your price range. The closest you will come to finding a true village atmosphere in coastal San Diego County. Welcome to Del Mar, Life By the Sea. There are many attractions, entertainment options, and fun things to do in the Del Mar area. From amazing shopping and fine dining to the extraordinary beaches and small village-like atmosphere, there is something in Del Mar for everyone. 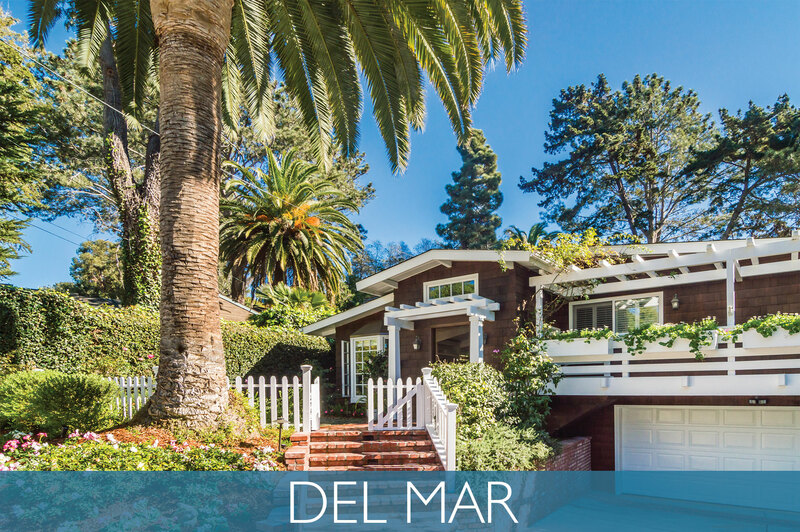 View more about Del Mar on Pinterest! For dog enthusiasts, there is Dog Beach, where owners and their dogs can enjoy the surf, sand, play Frisbee, and jog. Numerous gorgeous beaches of the Del Mar area have made the Time magazine's "100 Greatest Beaches in the World" list, with 15th Street Beach-which is also used in the opening credits for ABC's "Cougar Town"-ranked in the top 10 at number 4. Though Dog Beach didn't make the Time Magazine list, it did receive an honorable mention. The three main sections of Del Mar provide a variety of real estate options, locations, and views. From waterfront and private gated drives to lush small town charm, the Del Mar real estate market offers something to fit every taste and style. The Village offers some of the most expensive real estate in the country, anything from charming beach cottages to luxury estates with spectacular ocean views. Del Mar Heights is comprised of modest to expansive custom homes with many original owners that love being "west of I-5" and makes Del Mar Heights a highly desirable community to live, work, and play. Rural Del Mar is located just north of Via De La Valle Road, where you can own custom homes with oversized lots. Rural Del mar gives you the feel of being in the country, yet the beach is just a few miles away. Residents can expect a much higher level of privacy, with many homes situated on acre lots, and some may even have a horse or two.